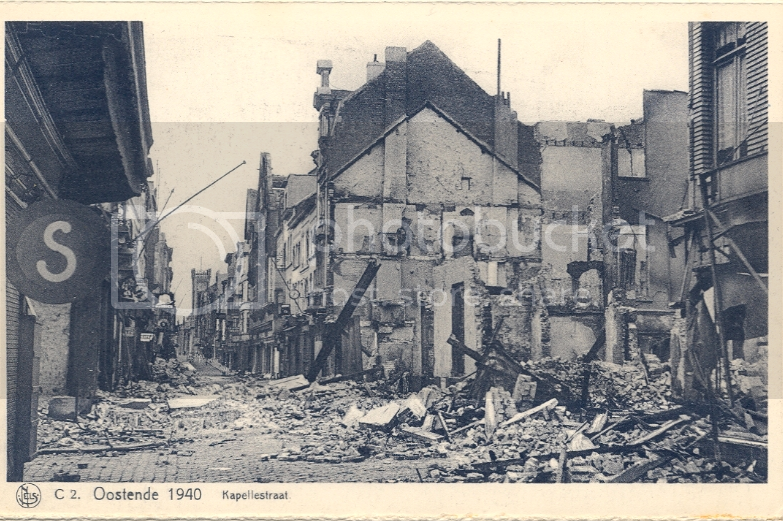 Discussion in '1940' started by rewdco, Apr 29, 2013. 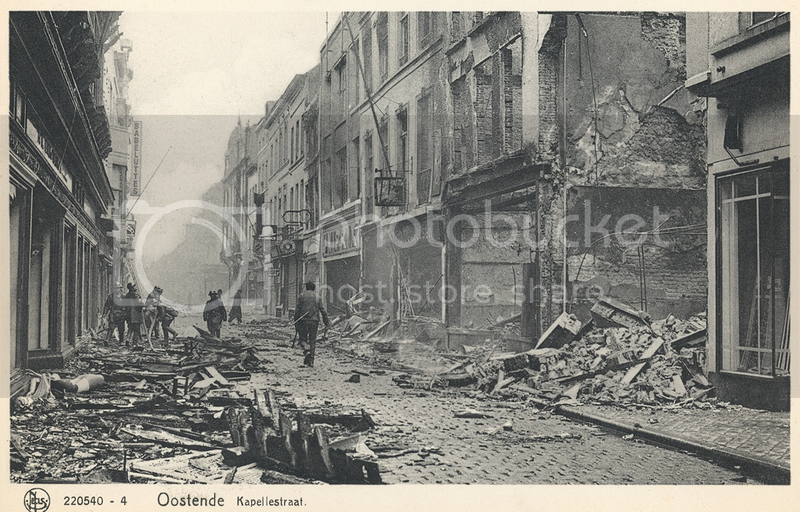 During my research on the Dunkirk and De Panne evacuation beaches, I have also found many pictures of Ostend. 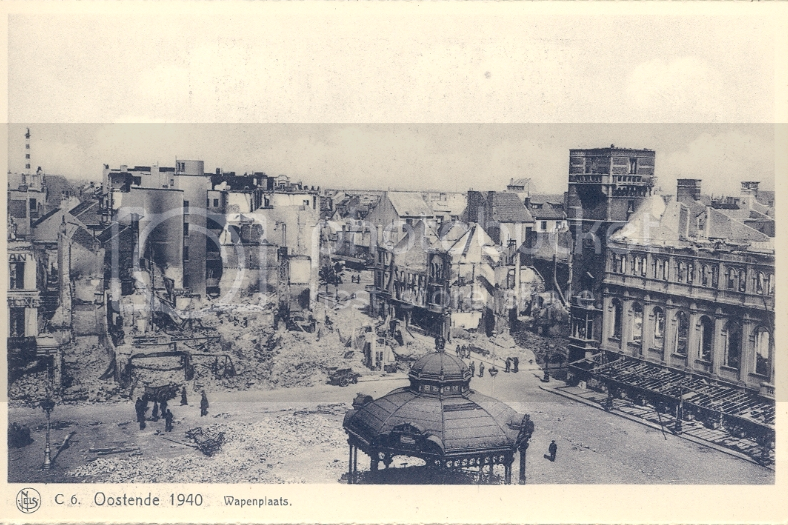 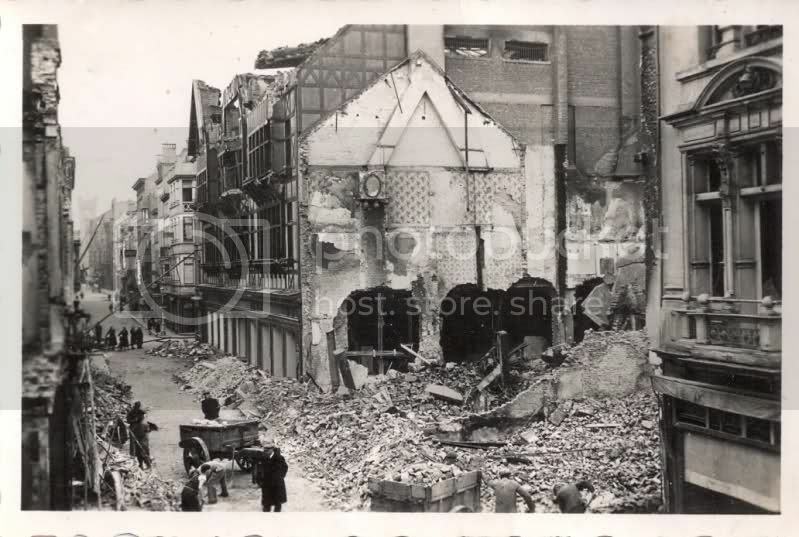 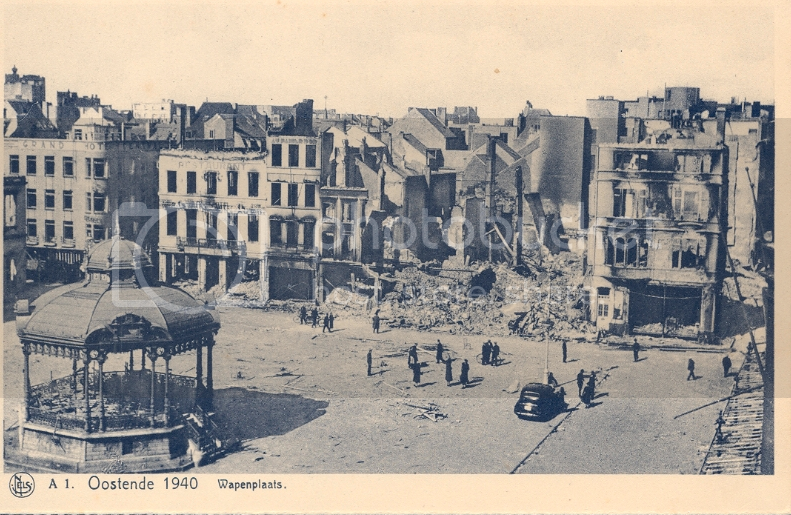 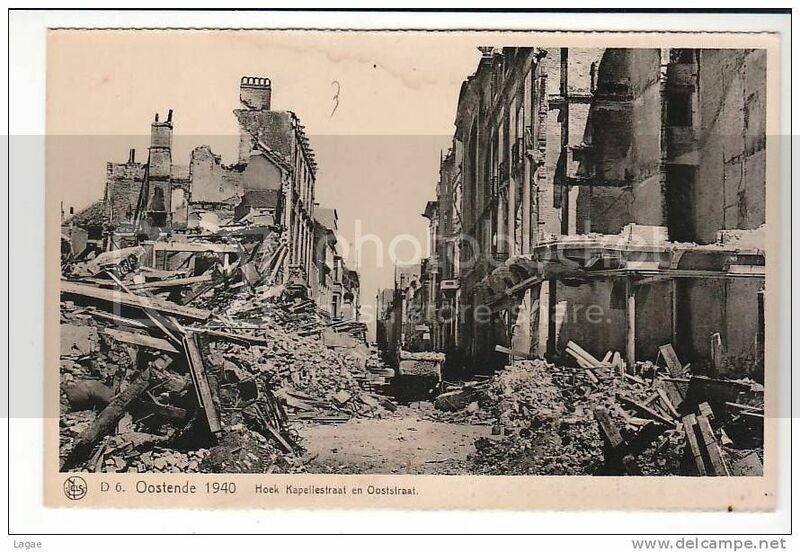 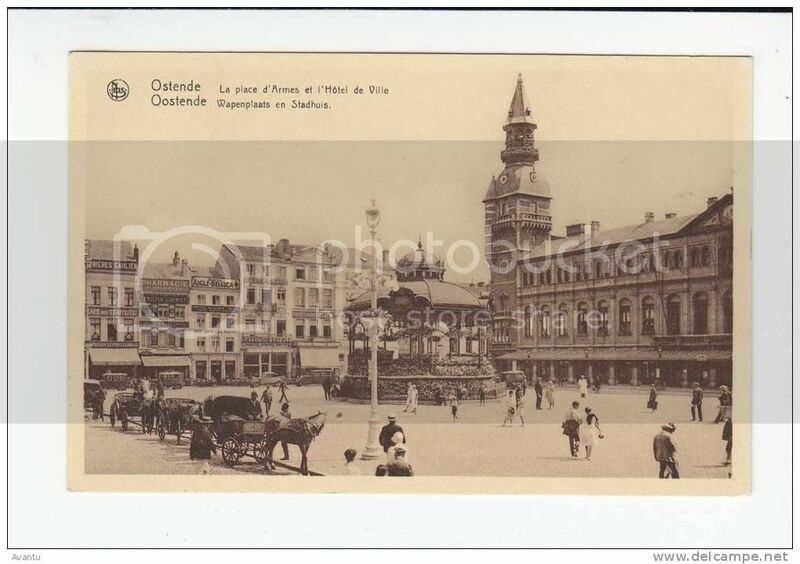 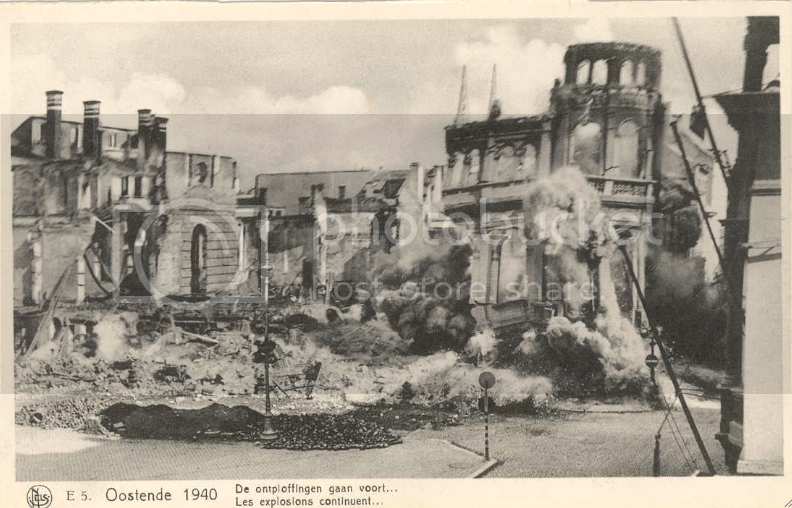 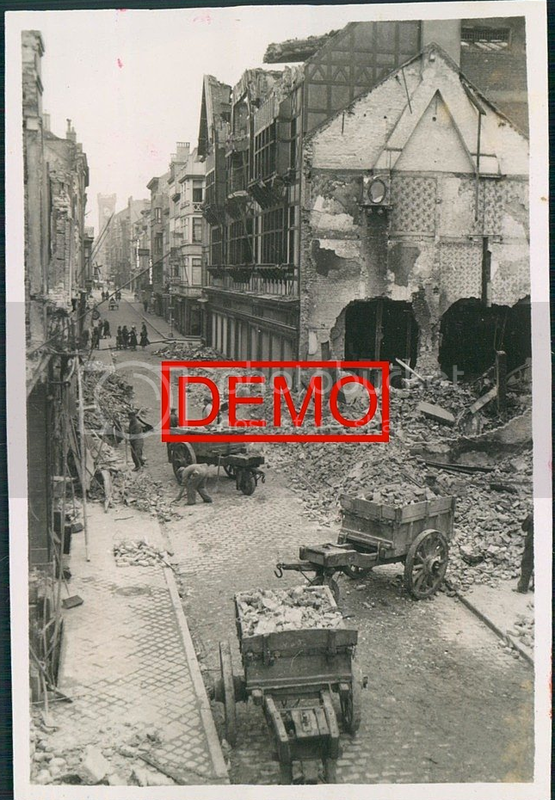 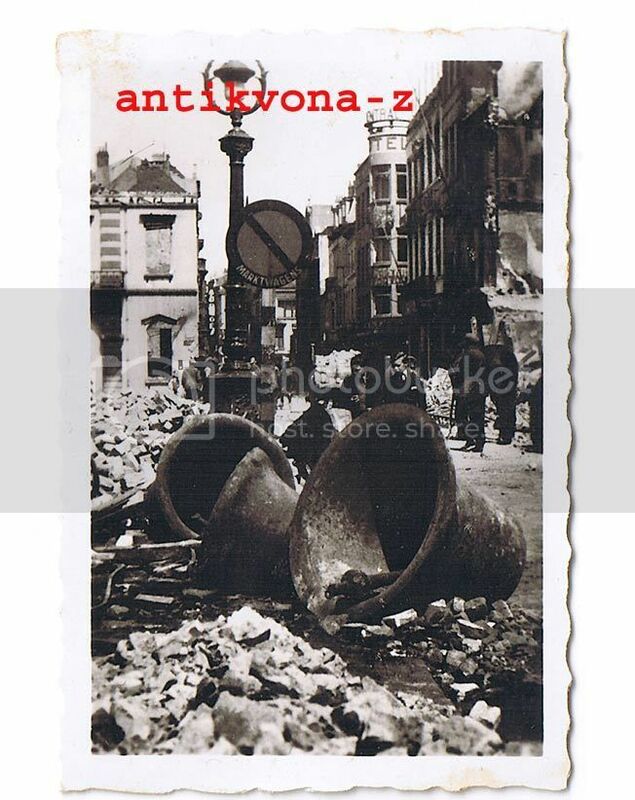 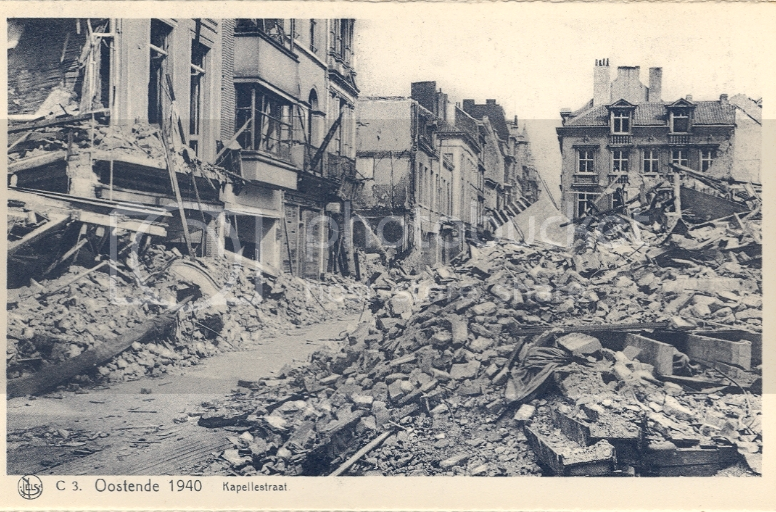 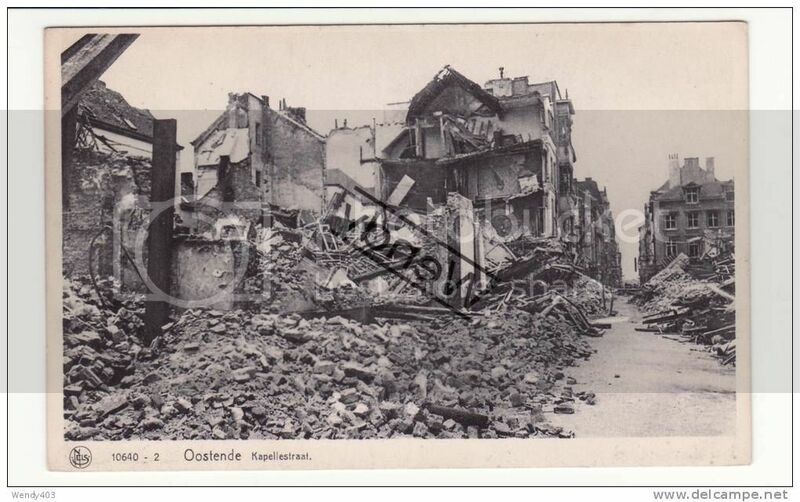 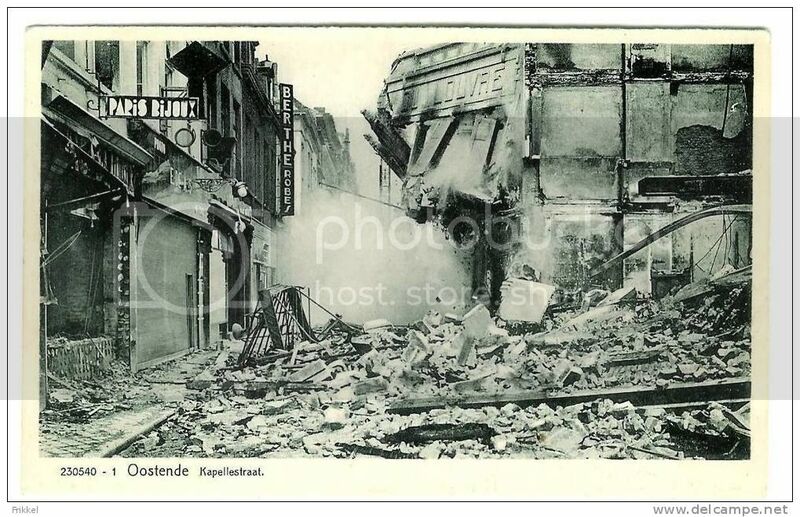 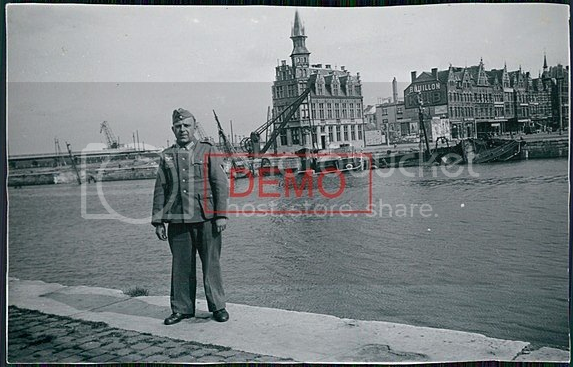 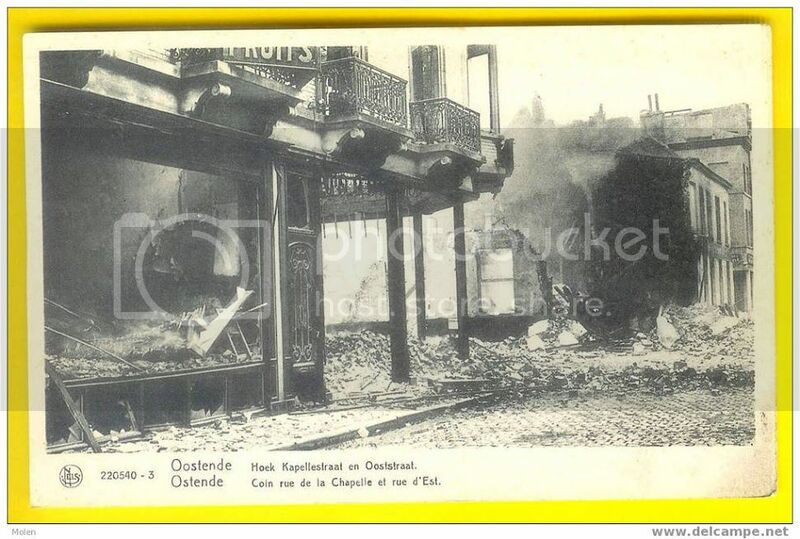 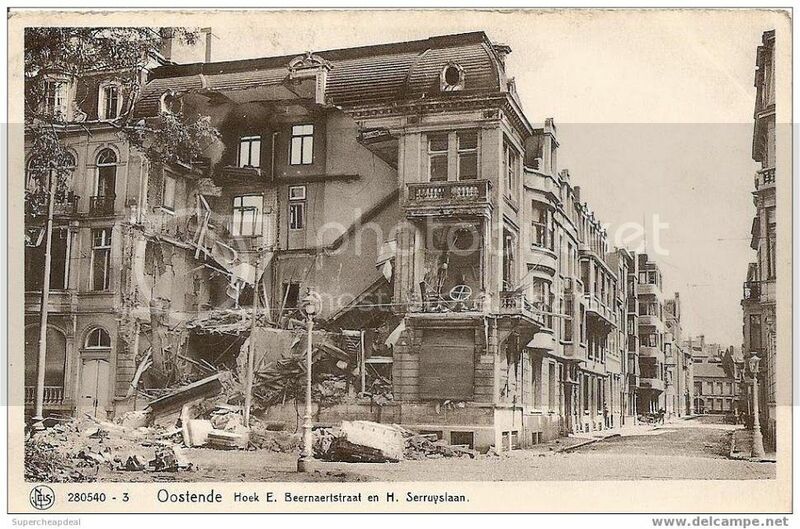 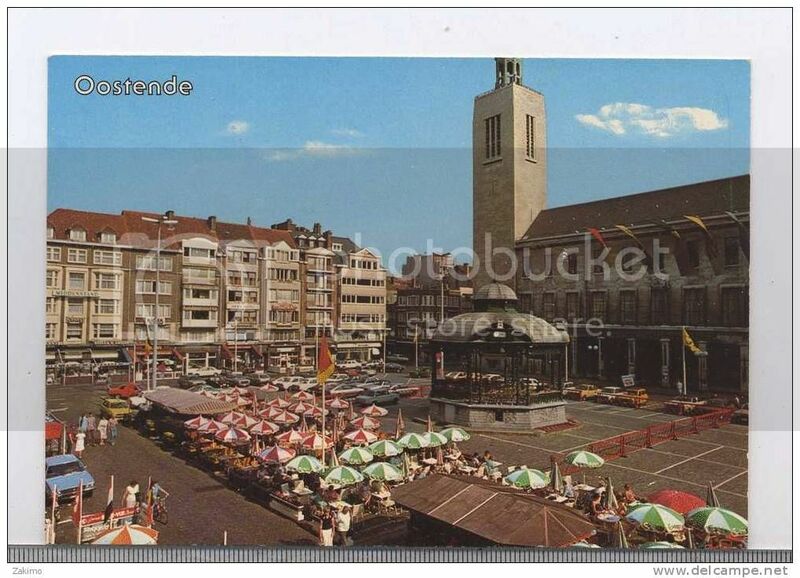 These pictures made me so curious about what had happened in Ostend that I started to do some research on the May 1940 history of that city as well. 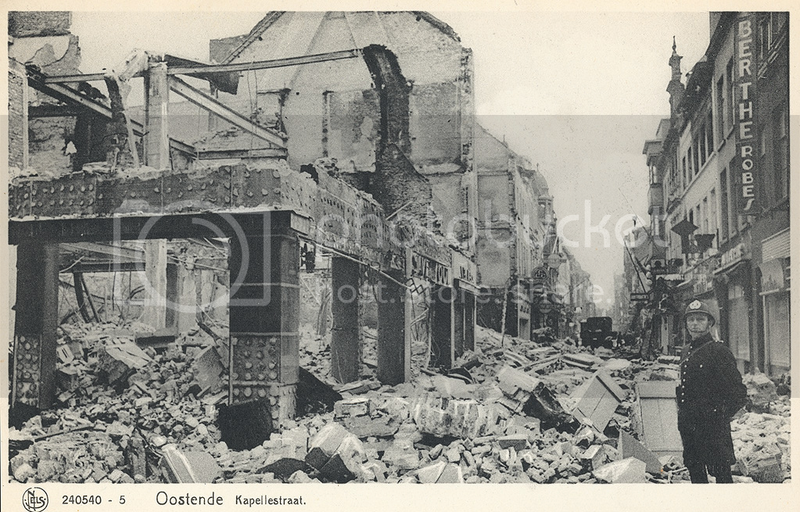 When Germany invaded Belgium on May 10th 1940, Ostend soon became a target of the Luftwaffe as it was a big port. 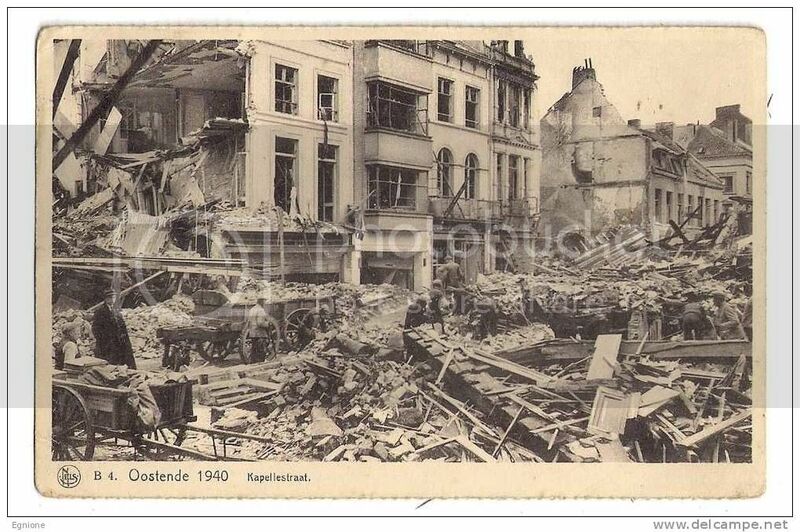 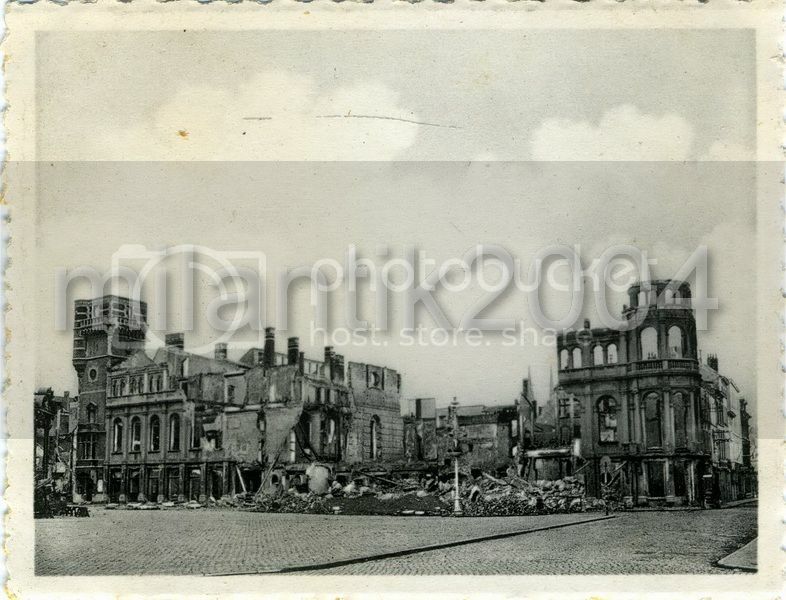 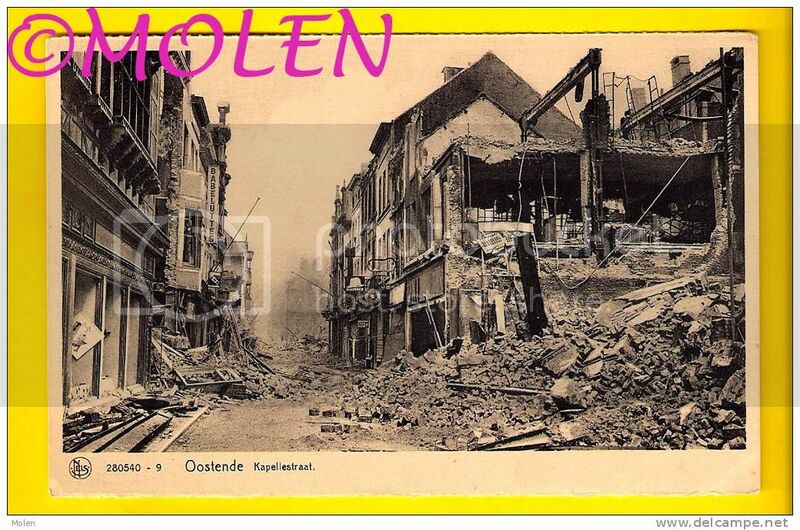 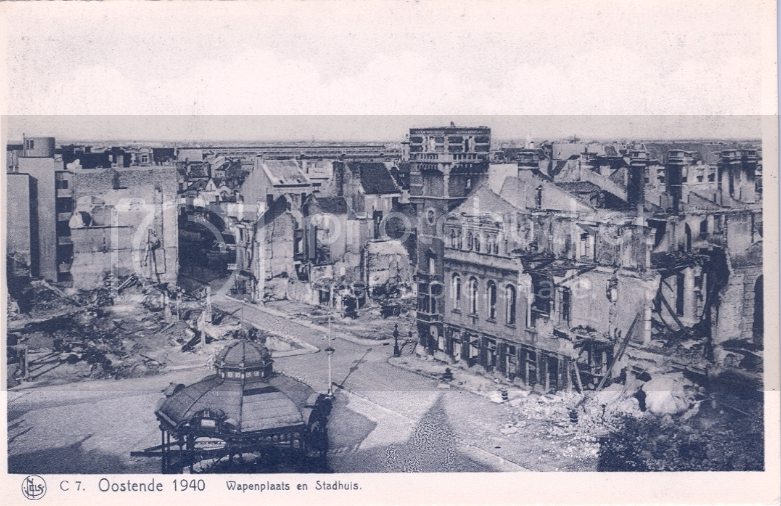 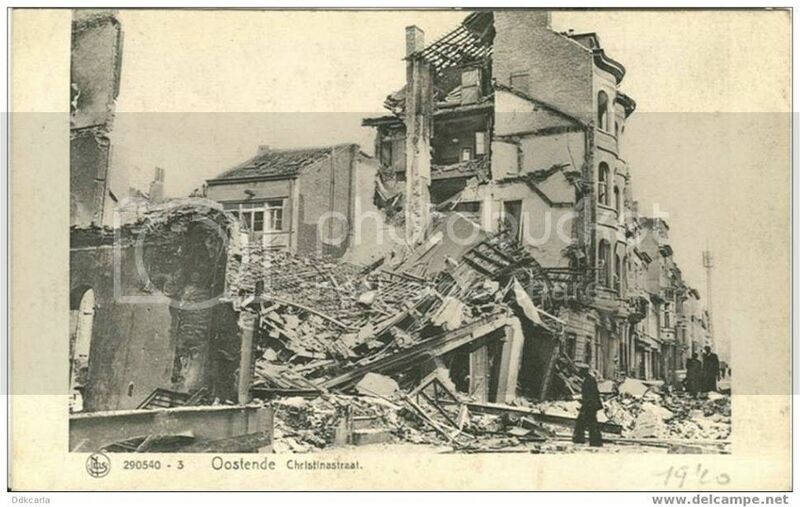 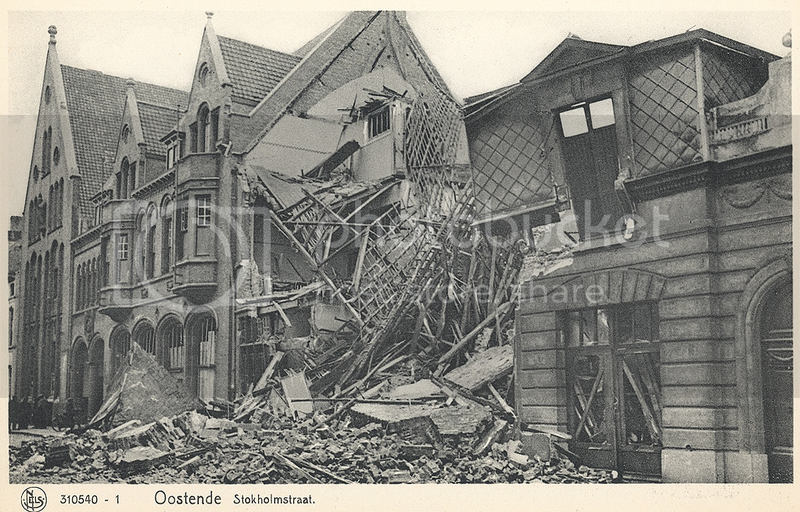 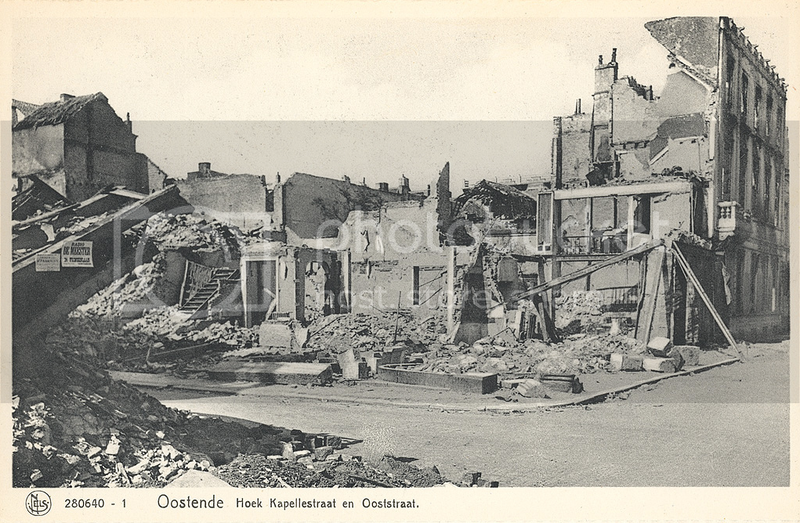 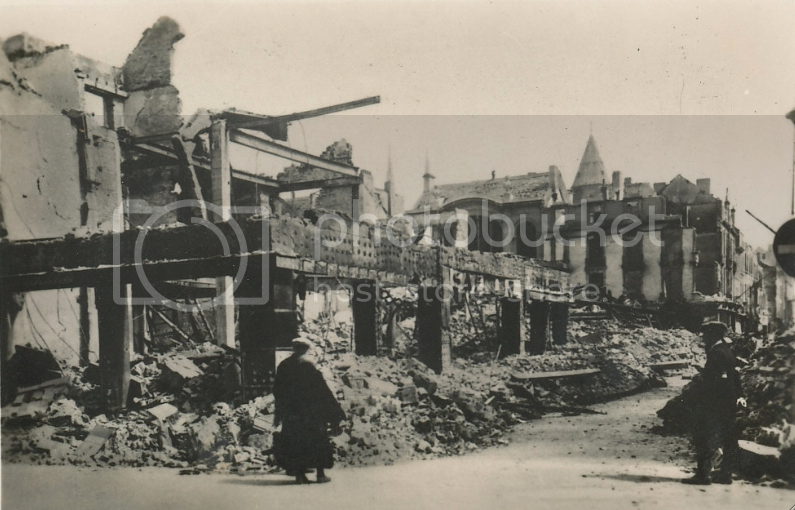 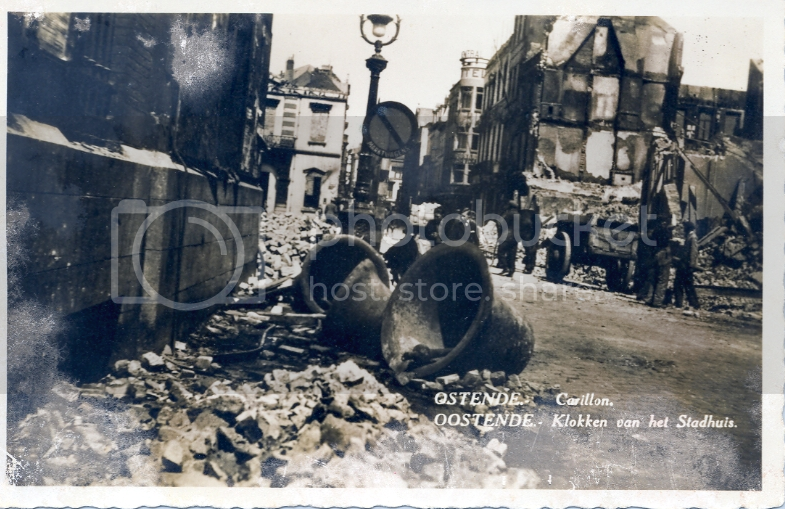 Already on May 13nd German aircrafts started dropping bombs on Ostend. 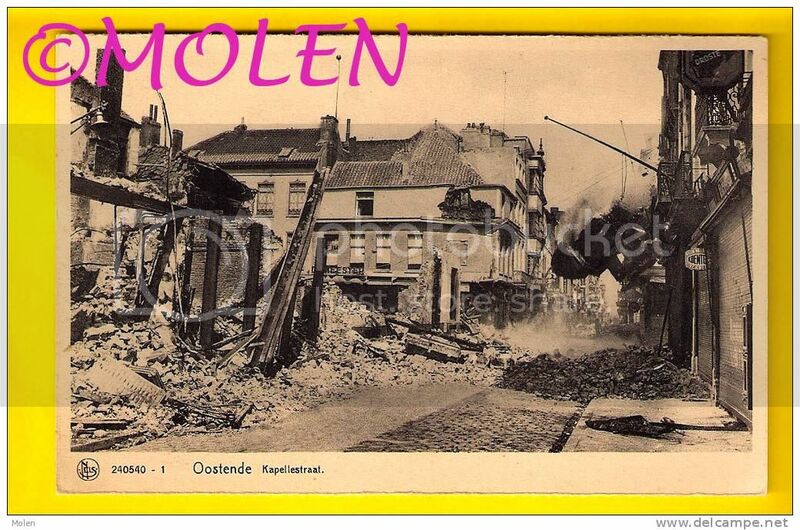 These air raids would go on almost daily, until the Belgian capitulation on May 28th. 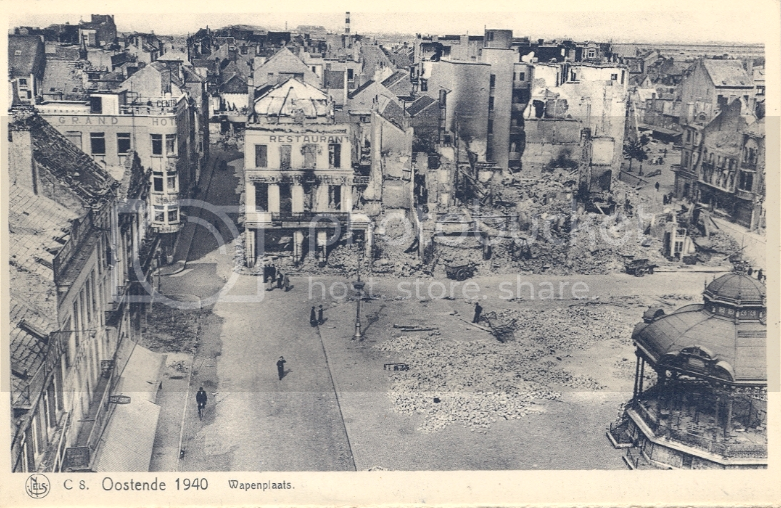 The German bombs hit a lot of civilian targets. 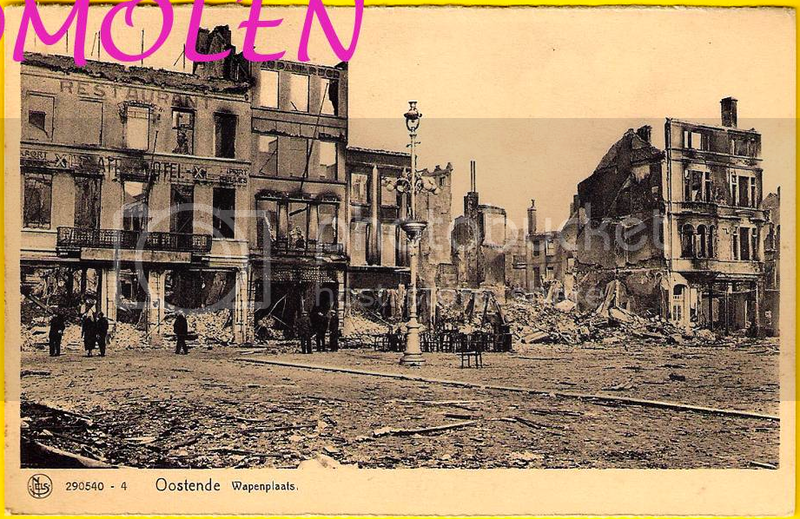 Famous Ostend photographer Maurice Antony took lots of pictures of burning houses and the ruins that remained, and sold these “souvenir sets” to the German soldiers… These postcards, plus some pictures that were taken by the German soldiers themselves, form the basis for this study… Where possible I have made some “then and now” comparisons, with the help of Google Streetview. 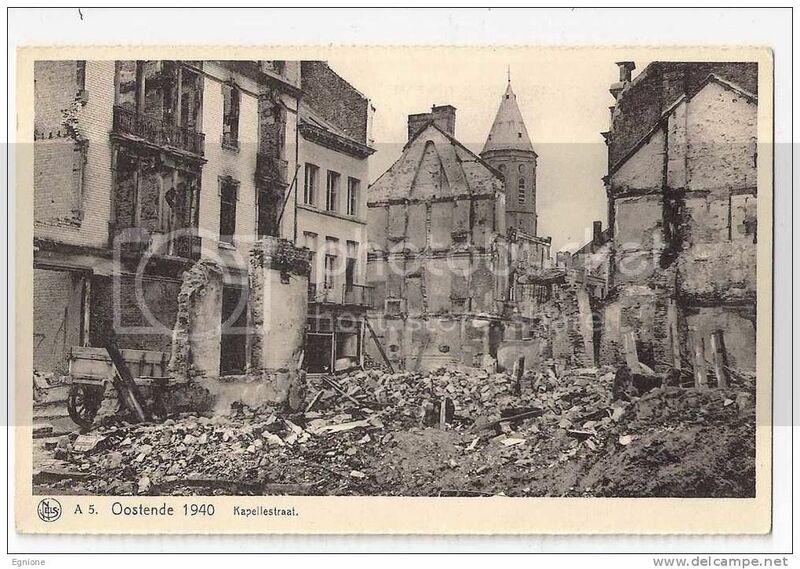 More detailed information (on a day to day basis) can be found on www.oostendsenostalgie.be/?p=78 . 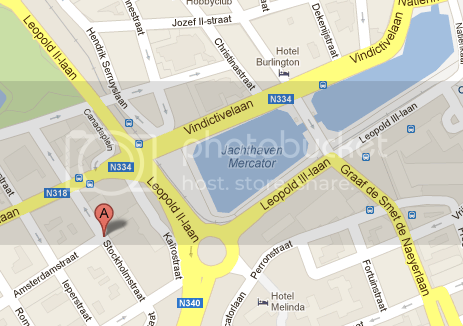 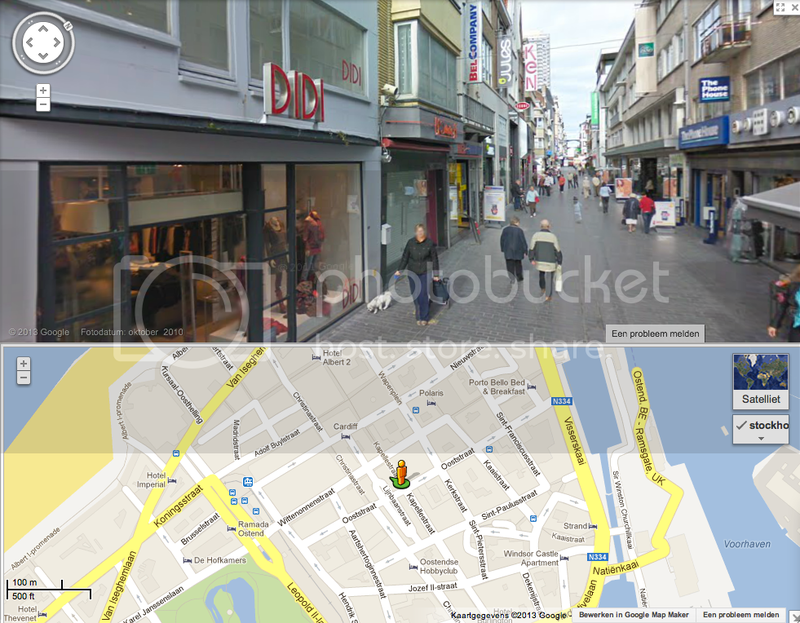 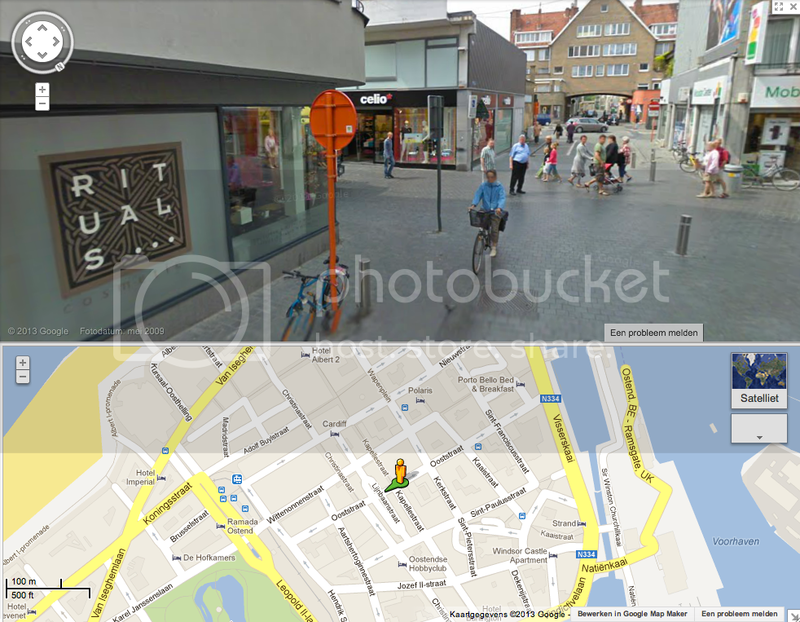 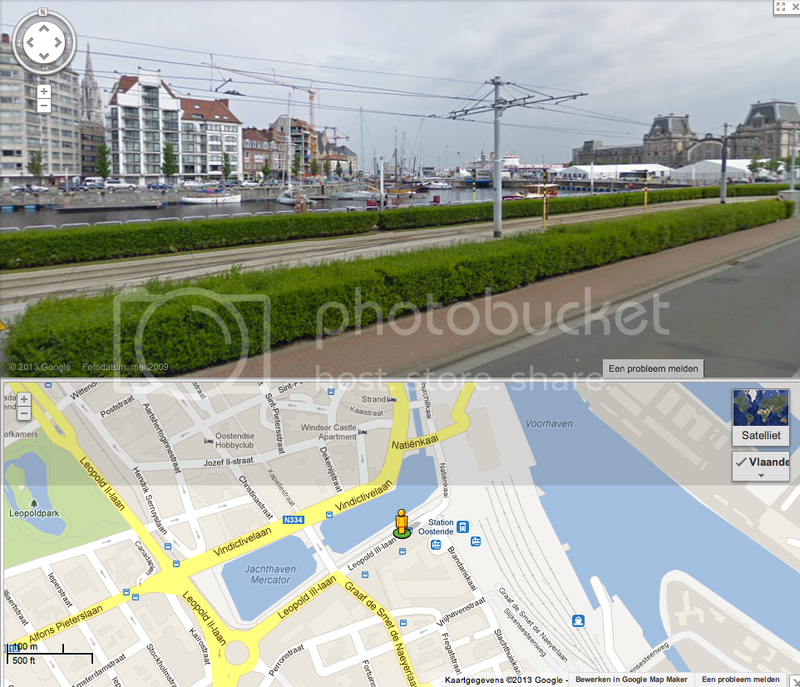 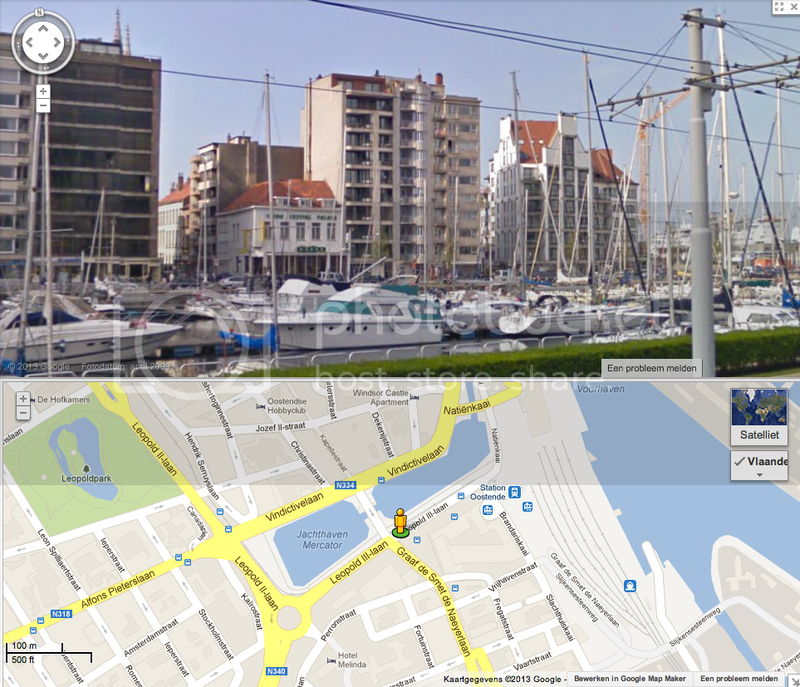 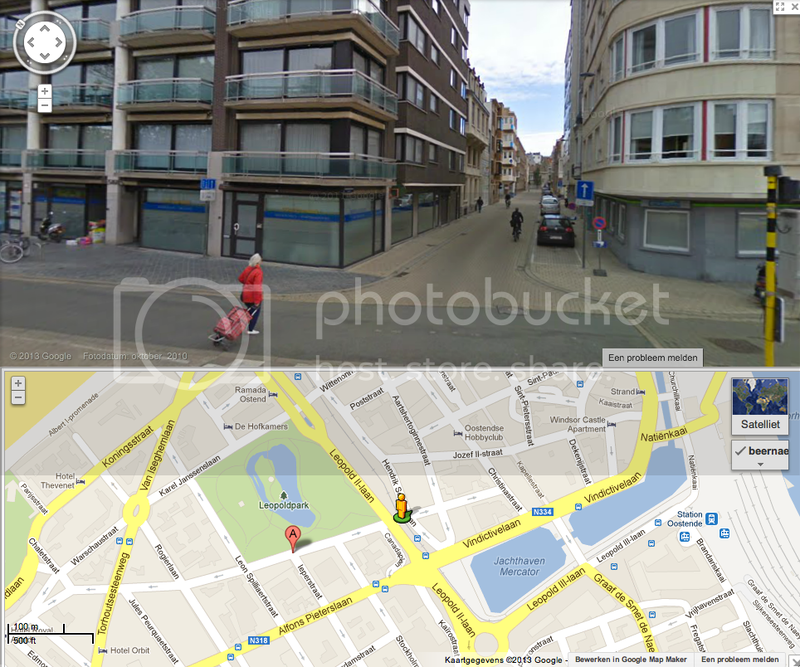 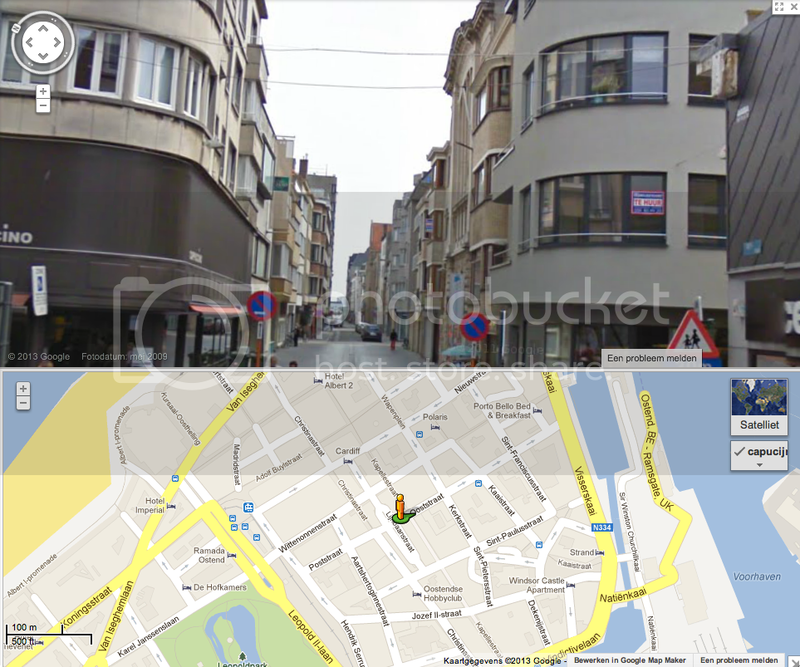 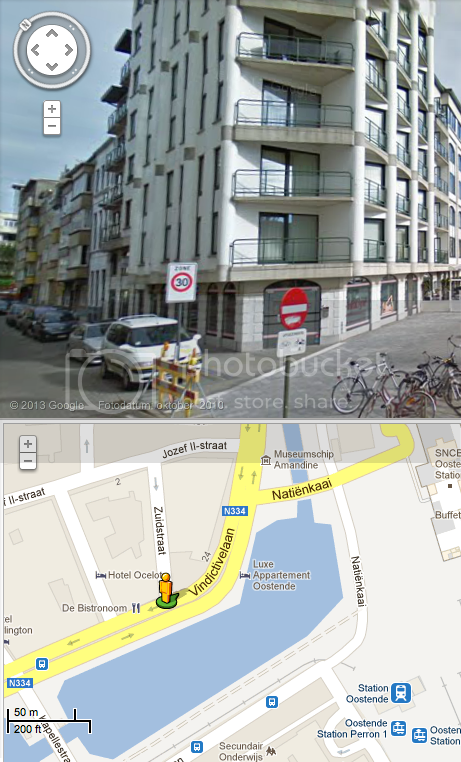 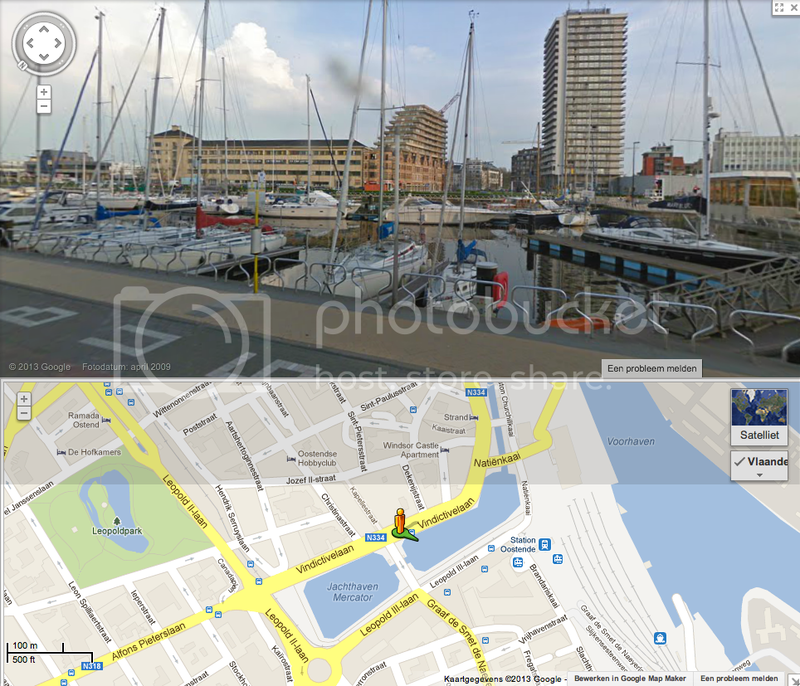 Let’s start our virtual trip at the Leopold III laan. 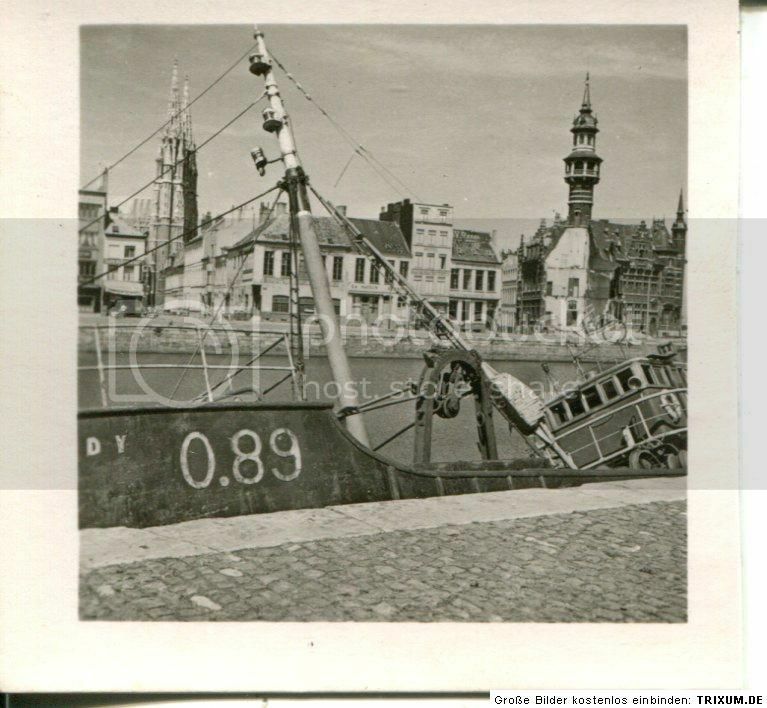 Here we find the shipwreck of the trawler “Freddy”. 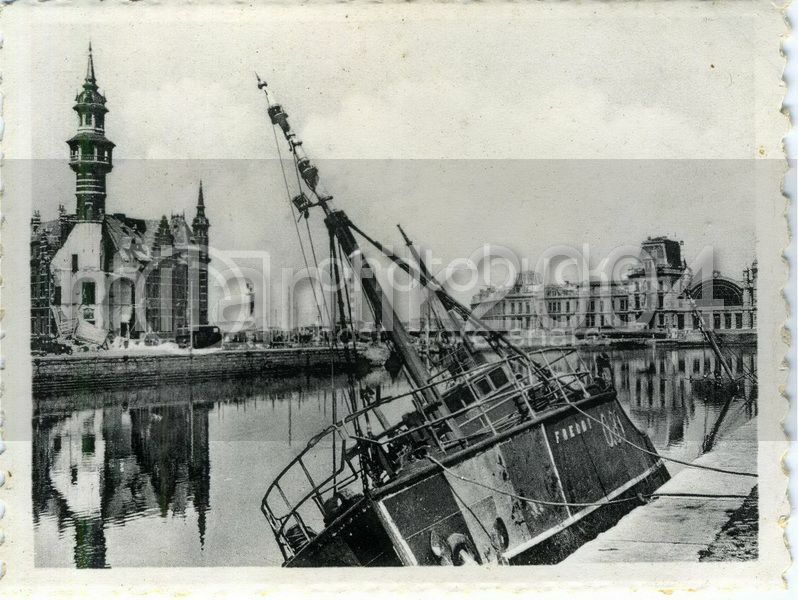 (Pictures of Freddy are often wrongly captioned as “Dunkirk”…) This Belgian ship was sunk on May 21st by German aircraft, it was later salvaged and commissioned by Kriegsmarine. 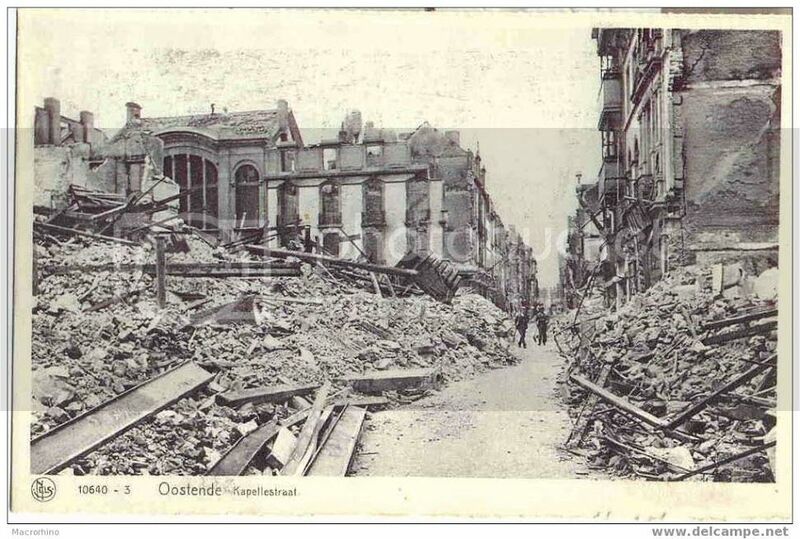 Another street in the same neighbourhood is the Stockholmstraat. 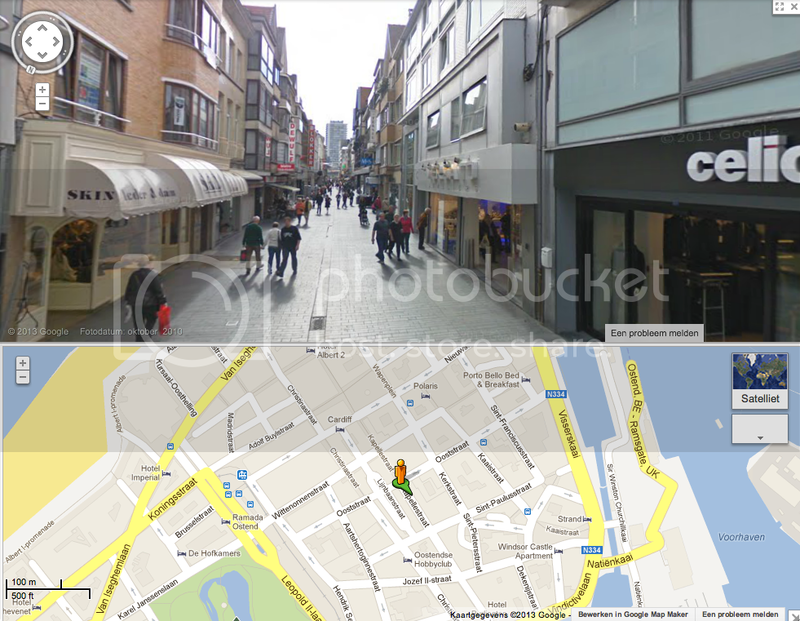 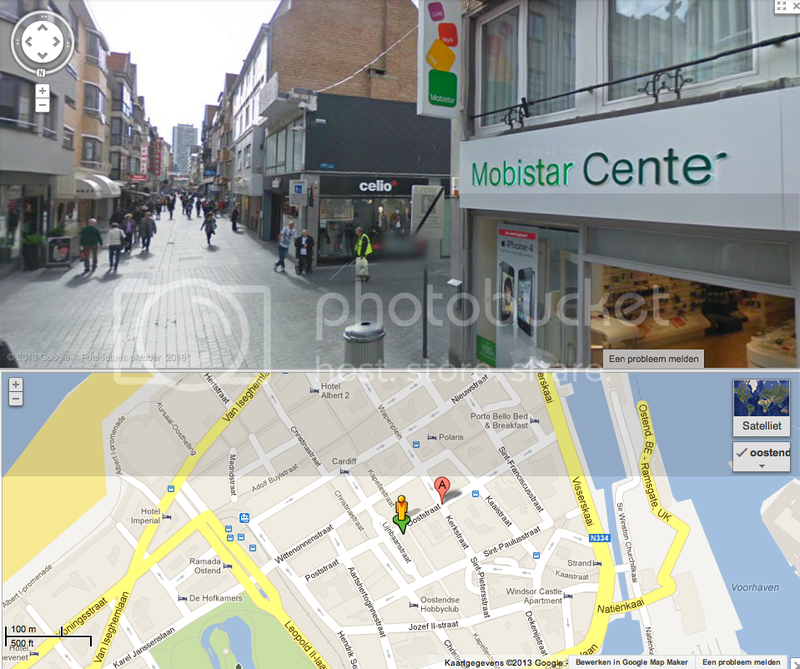 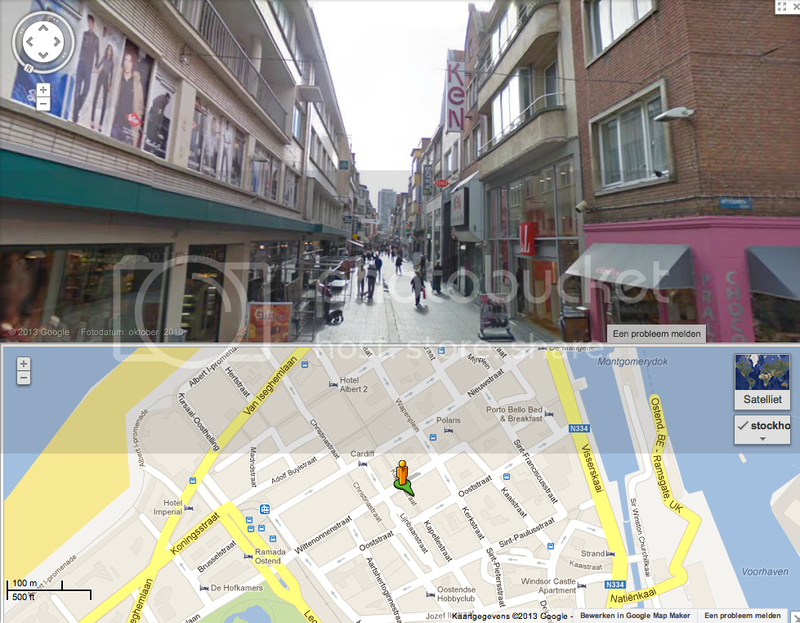 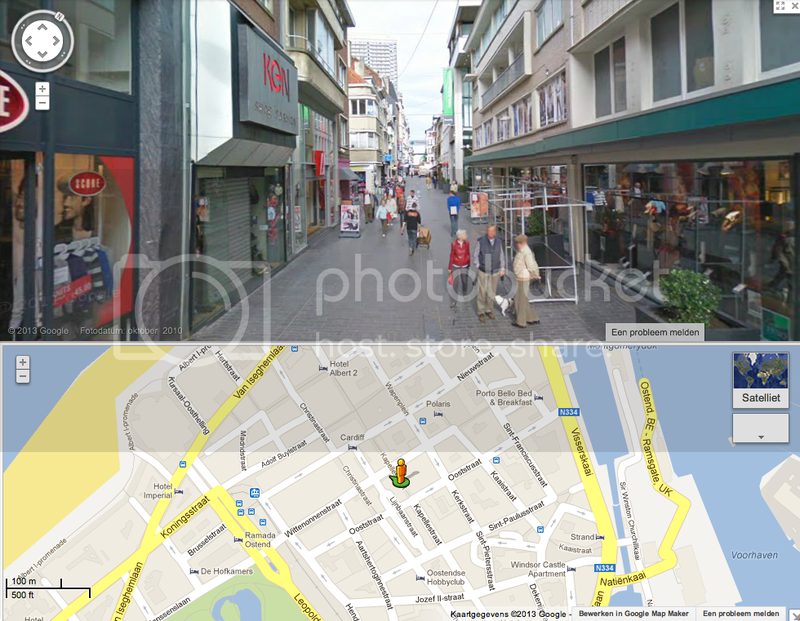 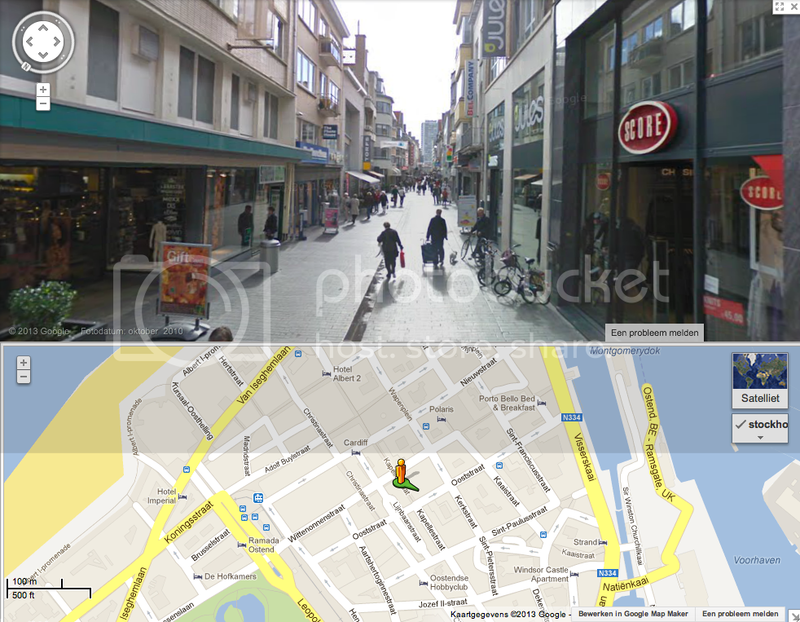 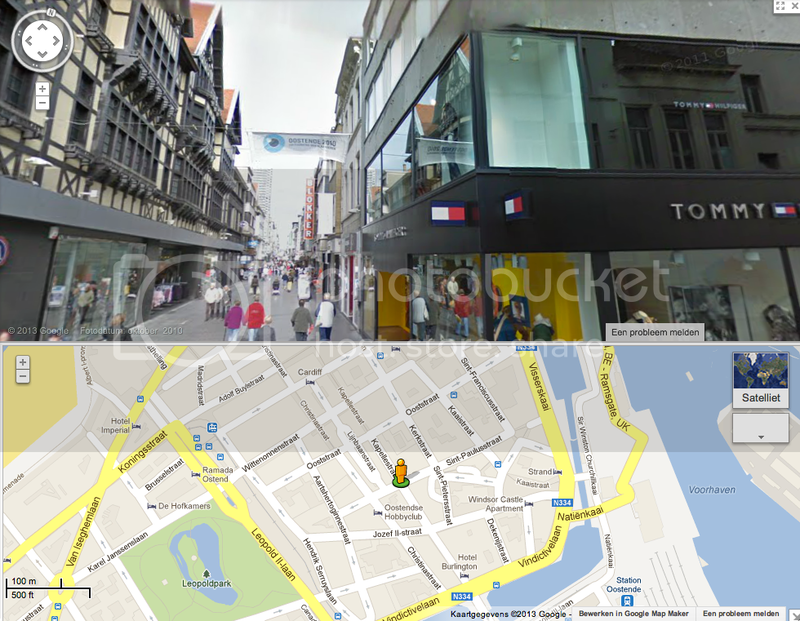 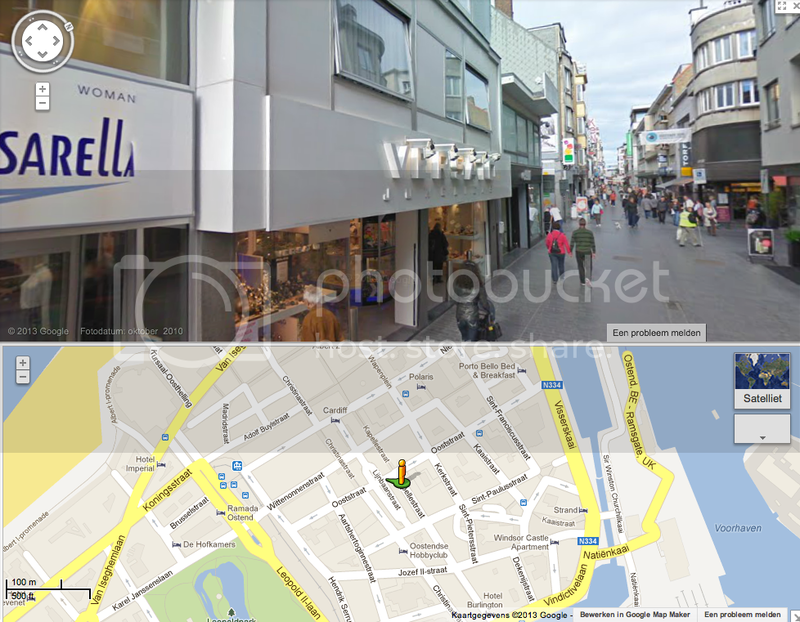 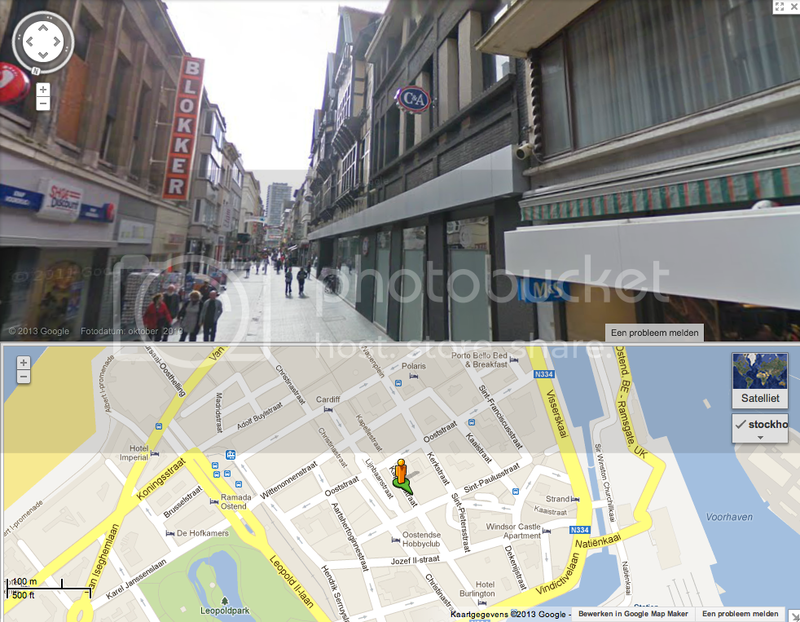 The next side street of the Vindictivelaan is the Kapellestraat (a famous shopping street). 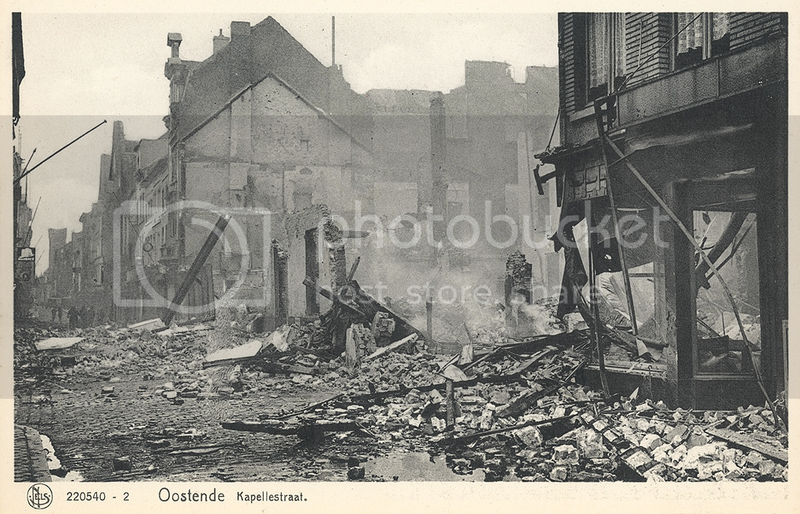 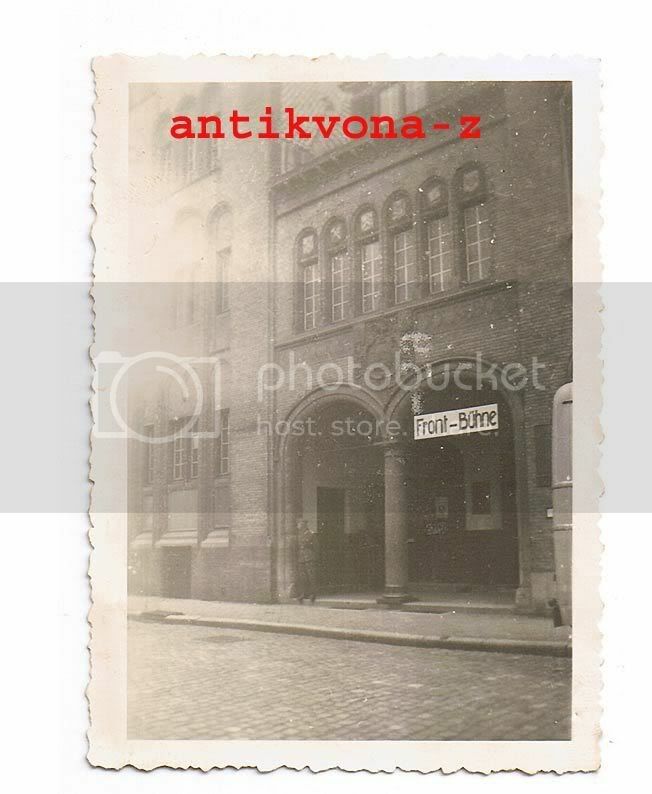 This street was more than once the target of the German incendiary bombs. 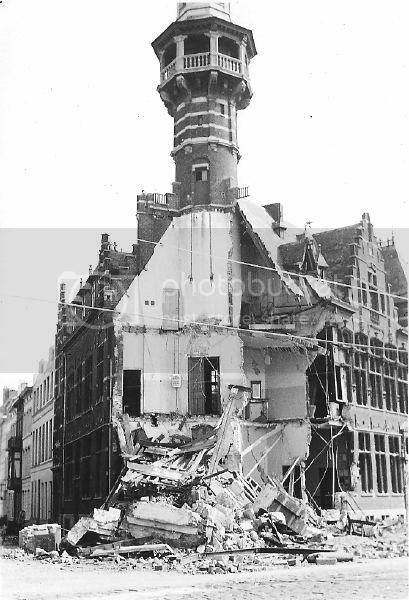 During this attack the top of the tower, together with the Town Bells, came down. 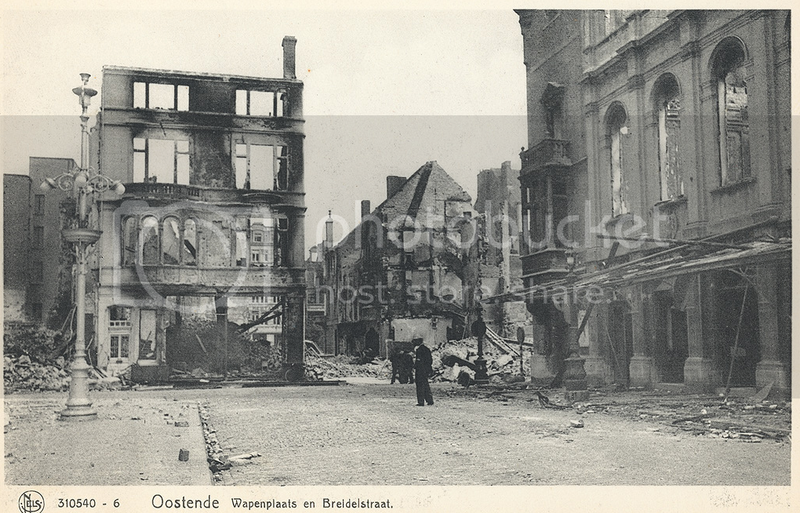 Later that day it was decided to remove the remains of the glass marquise of the Town Hall. 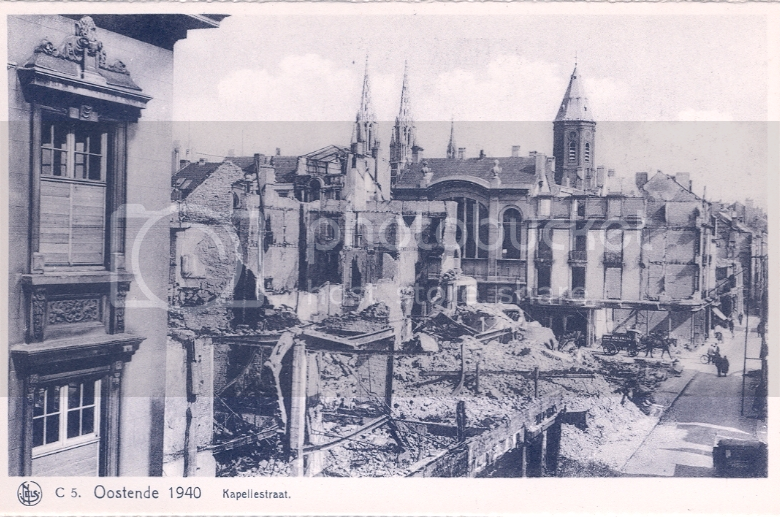 This proved to be a good idea, as the Town Hall was bombed again the next day (May 28th). 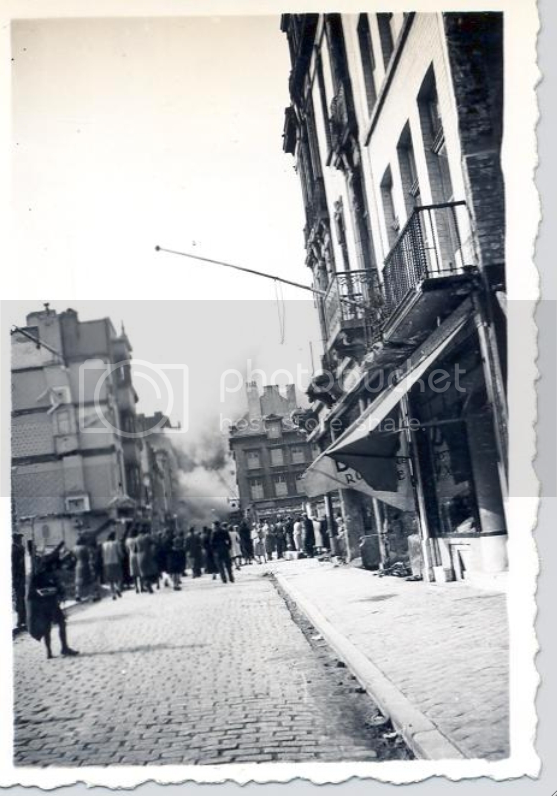 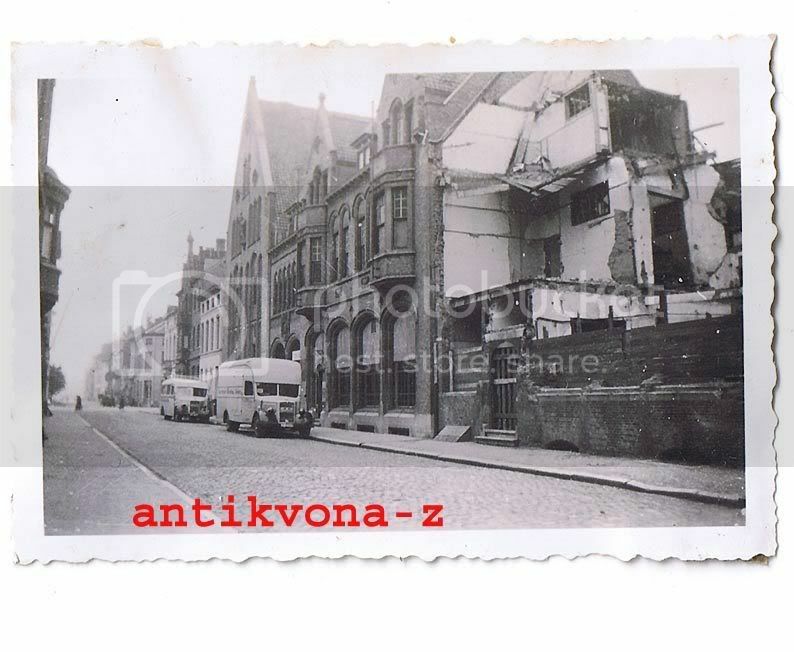 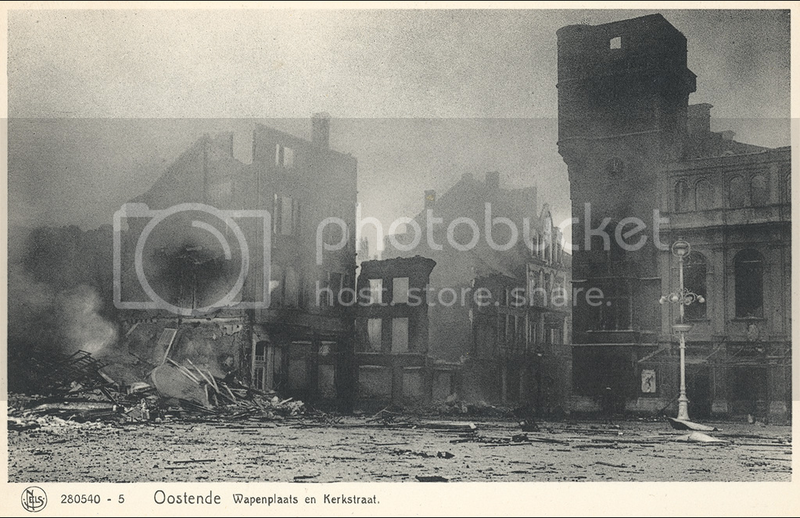 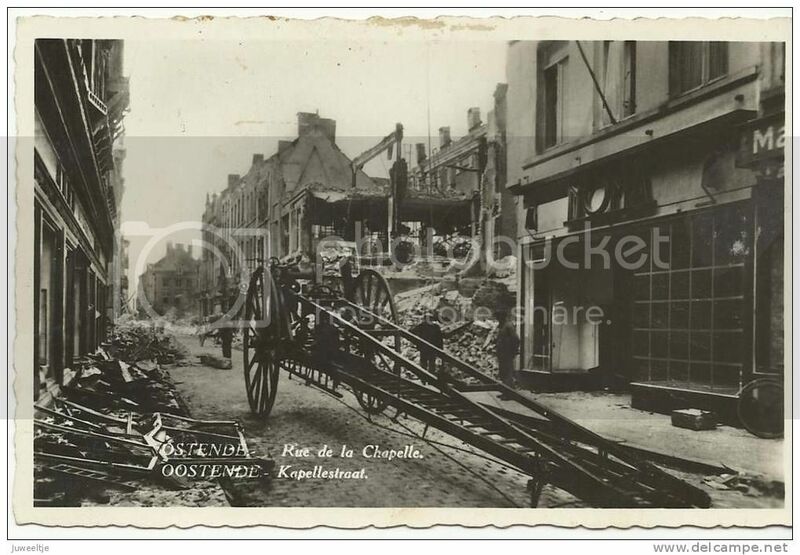 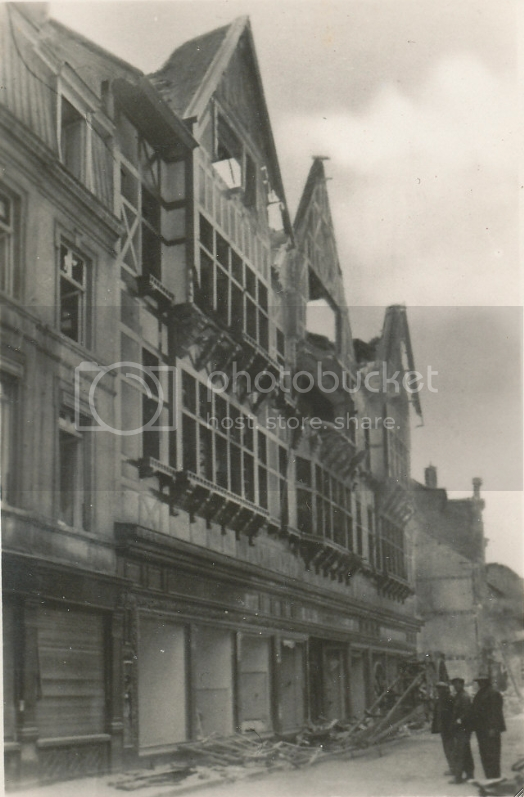 The photograph below shows people standing in the Kapellestraat, looking at a burning building at the Wapenplein. 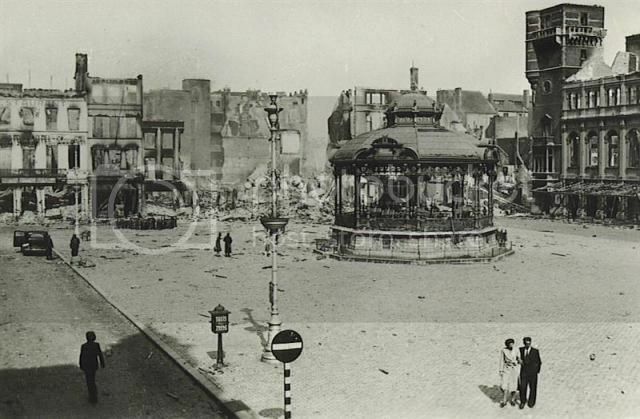 I think that what they see is the burning tower at the right of the Town Hall.